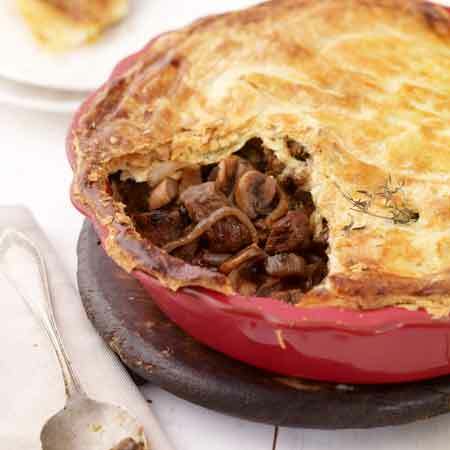 When topping the pie with its pastry lid, make sure the lamb mixture and the pastry lid don't meet, otherwise instead of nice crispy, flakey pastry, it'll be soggy. Heat 1/3 of the oil in a large heavy-based saucepan over medium-high heat. Season the lamb with salt and pepper. Cook half the lamb, turning occasionally, for 3-4 minutes or until browned. Transfer to a heatproof bowl. Repeat with the remaining lamb. Heat remaining oil in the pan. Cook the onion, garlic and mushroom for 4 minutes until soft. Increase heat to high. Stir in the tomatoes, stock, wine, tomato paste and chopped rosemary. Cover. Bring to the boil. Reduce heat to medium-low. Return lamb to pan. Cover and cook for 1 hour. Uncover and cook for a further 30 minutes or until lamb is tender and the sauce thickens. Set aside for 1 hour to cool slightly. Transfer to a bowl. Cover with plastic wrap. Place in the fridge for 1-2 hours to cool completely. Preheat the oven to 200ºC. Brush a pie dish with oil. Spoon lamb mixture into dish. Top with the pastry. Trim excess. Use a fork to press the edge to seal and decorate. Brush the pie with egg. Cut a cross in the top of the pastry. Decorate with a rosemary sprig. Bake for 40-45 minutes or until puffed and golden. Serve with steamed green beans & Garlic mash.